Students have returned and Uptown has hit the road to present the Hottest new Game Show to hit the College market for the Fall 2011 semester. See what is creating the Buzz on campuses across the North East. Our High Energy Game Show Hosts presents our version of the popular Minute To Win It Game Show. Contestants compete for a predetermined prize package in this fast paced 90 minute Game Show. Bring the FUN to your next event with one of our Game Shows! We involve numerous people from the audience to compete for Fun and Prizes! Call the Funline today 888-220-0077 to check availability or visit us on the web www.funline.com to check our complete game show catalog. The Uptown staff travels the entire Eastern United States bringing FUN everywhere we go! Game Shows for College, Corporate, Bar or Bat Mitvahs, Team Building Activities, Trade Shows, Private Parties in Buffalo, Rochester, Syracuse, Albany NY. Uptown's Game Show Creator Anne Marie has produced another Hit Game Show, where several contestants will compete in challenges at the same time to see who will take home the Prize. Gone in 60 Seconds is a great Game Show for Corporate Team Building Activities, College, University Orientation or Homecoming Programming. The show involves many contestants and several rounds for maximum FUN! Contestants will be challenged to complete a Task in 60 Seconds or less. The Task Blueprints will be displayed on our Big Screen or LCD Flat Screens depending on the venue. If the Contestants Succeed and Complete the Task they will move to the next level, if they fail They are Gone! Fast paced 75-90 minute program with maximum participation! So what are you waiting for? Call Uptown's entertainment specialists at 888-220-0077 to check availability and pricing. Follow the Uptown Blog to keep in touch with the latest Entertainment ideas in Buffalo, Rochester, Syracuse NY or anywhere in the NorthEast. Uptown specializes in Casino Parties and Casino rentals and has been entertaining Corporate, Private, College, and School Parties for almost three decades. From the moment your guests enter the room treat them to the Red Carpet Treatment. Uptown is proud to present the best of both worlds with Red Carpet Photo's. Our professional and courteous Photography staff will ensure that your guests maximize the Red Carpet Photo experience. So...what is Red Carpet Photo's? Uptown took the popular Photo Booth concept and added a touch of Class for your wedding, sweet sixteen, bar/bat mitzvah, marketing event, fund raisers, proms, college theme nights or any occasion. 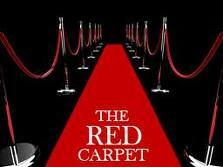 Just like being at the Grammy's or the Oscars we bring the Red Carpet experience to your party. Unlike most photo booths that allow two, three or possibly four people into the booth, Red Carpet Photos allows singles, couples or group photos. Professional backdrops and lighting create the canvas for your unique photo experience. Available upon request is our prop package that includes wigs, boas, glasses or themed accessories. Guests receive their 4" x 6" photos presented in a classy folder/frame with your optional personal message or event date. Great idea for party favors or just to remember your special day or event. Our professional printers deliver the digital prints on professional printer paper in only a few seconds. Every wedding package includes a memory book for the Bride/Groom with copies of every photo with a special message from your guests. Uptown also provides a digital copy of every photo taken at the event on dvd or flash drive for your personal use. Red Carpet Photo's requires a minimum of 8' x 10' of space and access to one standard power outlet. Call the Funline today at 888-220-0077 and we will be happy to answer any questions. Please visit us on the web http://www.funline.com/ and fill out our online quote request form to check availability. Uptown will be happy to incorporate any theme or develop one for your event. Please subscribe to the Uptown Blog for updates and entertainment ideas brought to you by your friends at Uptown Entertainment & Events. Each year Tops Market supports the Juvenile Diabetes Research Foundation by raising money to find a cure. Every Tops store in Buffalo, NY and throughout Western New York with the generosity of their customers raise thousands of dollars to help find a cure. This year Tops Market #118 in East Aurora, NY teamed up with the American Legion Post and Uptown Entertainment to create a FUN Casino Party. The sun was shining on the guests that came out to support JDRF Sunday afternoon. The Money raised will help get one step closer to finding a cure. Everyone had the opportunity to win many baskets that were donated along with a Pick a Card Drawing for Gift Cards and many raffles. Many of the local businesses sponsored assorted casino tables to create the Fun for the afternoon. Thank you to Aurora Liquors, Try-It Distributing, Five Star Bank, East Aurora American Legion Ladies Auxilary, Terry's Photo Studio, East Aurora Advertiser, Kiss-N-Greens Golf Club, EWE Bee Acres and Tops Market #118. The ladies auxiliary from the East Aurora American Legion worked hard in the kitchen to supply the attendees with a great meal. The Tops Market #118 associates staffed the raffle tables and raffles. Uptown Entertainment supplied the Casino Tables for the entertainment of the attendees and the music. Uptown was also happy to help with Emceeing the event and the basket raffles. On behalf of Tops Market #118 from East Aurora and The American Legion East Aurora Post and the staff from Uptown Entertainment, we want to send a heartfelt THANK YOU to everyone that attended and made this a very successful event. JDRF is the world leader in funding research to cure Type 1 Diabetes, an autoimmune disease that strikes children and adults suddenly and lasts a lifetime. JDRF's mission is to find a cure for diabetes and its complications through the support of research. JDRF is also committed to developing new and better treatments that improve the lives of those with Type 1 diabetes in the near term and keeping them healthy while they advance to a cure. Business Tradeshow mixers are where you get the opportunity to show off your business and create a positive corporate image. What sets you apart from the other businesses? How do you get the attendees to stop at your booth and say hello? What are your objectives or expectations from the tradeshow? How do you get the names, business cards or contact information for followup? Let the experts at Uptown create a Fun and effective solution to accomplish your Tradeshow objectives. Recently, Uptown Larry worked with the professionals at Hahn Training LLC to create a FUN Tradeshow booth for the CELAA Expo at Salvatore's Italian Gardens in Buffalo NY. Putting the FUN in fundraising is important to have a successful event. Uptown has been a leader in the entertainment business for almost three decades. During that time we have helped many community groups in the North East with our many entertainment ideas and themes. Fantasy Casino Parties, Texas Hold Em Tournaments, Red Carpet Photo's or a Game Show Night. Game show nights can include our most popular stage show Price It Right, The Feud or our newest addition Gone In 60 Seconds a spinoff of the popular Minute To Win It. Uptown is also proud to offer award winning Disc Jockey Entertainers, Professional Master of Ceremonies or musical entertainment. If your event is in the Buffalo, Rochester, Syracuse areas of New York please call the Funline 888-220-0077 for additional information on how Uptown can bring the FUN to your fundraiser. In an effort to assist our Uptown family of clients, we will continue to offer ideas to assist with planning successful events. Before doing anything else, you must decide what the purpose of your event is. Many charitable events have more than one goal...figuring out the details of your event will depend on what goals your group or organization is trying to achieve. Your organization staff, the event host committee and key fundraisers must decide what amount of money you want to raise at the event. If it is a true fundraising event, then everything in your plan should be gearded to raising that specific amount of money. It is important to remember, the amount you choose should be the amount you want to net, after expenses are deducted. Every fundraising event should include a complete budget listing of all expenses required to hold the event. The Budget should include staff, invitations, advertising, space rental, catering, entertainment, transportation, security, utilities or anything else to make your event a Success! To ensure a successful event, a committee and committee chairperson should take command of the event. They are responsible for encouraging others to assist and getting local business leaders, local celebrities and helping to bring sponsors and donors to the event. 5. Who will you Target? Decide who will be your attendees...open to everyone, local business people, parents...once you decide...go to step six! How will you get the word out that you are having a fundraiser? Here are a few suggestions: direct mail invitations, email blasts, word of mouth, press releases, posters or phone banks to name a few. In order to have a successful event you have to get the word out! Once you have the word out...you must have a procedure in place to make the ticket sales. Who will sell the tickets, how will they be delivered and who will be responsible to record incoming funds. Also very important to spell out exactly what the ticket to the event includes. It is very important that once you hold your fundraising event to remember to say Thank you! Include in your thank you's the volunteers, contributors, vendors, staff and a big thank you to the attendees. A little sugar goes a long way. We Invite you to join the Uptown Parties Blog to receive the latest in news and entertainment ideas in the Buffalo and Western New York region. Uptown will be bringing the excitement of Casino Night Entertainment for the fourth consecutive year to a fantastic corporate group in Buffalo, New York. The excitement of a real Casino with Uptown's Professional dealers at the tables. Guests will enjoy the Casino Grade Tables such as Black Jack, Roulette and Craps. Check us out on facebook www.facebook.com/uptownevents for event photo's and updates. We also invite you to become a fan to stay on top of the exciting entertainment ideas from Uptown. If you are planning a party in Buffalo, Rochester, Niagara Falls or anywhere in Western New York consider a Casino Party from Uptown! Our professional party planner will help you create a theme for your next event. Casino Parties or perhaps one of Uptown's FUN filled Game Shows will bring your event to the next level of FUN. We feature all your favorite game shows... Price It Right, The Feud and if you like Minute To Win It, you will love our newest game show GONE IN 60 SECONDS. Uptown is proud to say we have been entertaining the entire North East, including Buffalo, Rochester, Syracuse and Niagara Falls New York for over 30 years experience. We bring the Excitement to your Parties... so pick up the phone and call the funline 888-220-0077 to talk with our Party Professionals. Look no further, Uptown has brought Red Carpet Photo's to Buffalo, Rochester and New York. Uptown has taken the Photo Booth one step further, with a touch of pizazz! Planning a party or special event and want to add something special that your guests will remember. Red Carpet Photo's is the answer! Many themed backdrops to choose from or let our professional staff help you design the perfect theme and backdrop. Prop packages are included with most packages to enhance the Fun in your photo's. Pictures are 4" x 6" color, black and white or sepia presented in professional folders within seconds after the pictures are taken. Photo's can be personalized and are a great favor or keepsake for your party. Uptown brought our FUN filled and educational Black History Game Show to Orchard Park at ECC South Campus. Great group of students competed for over $200 in prizes to Celebrate Black History Month. We also have had the privilege of bringing this exciting Black History program to other College, University and School Campuses in the North East during the month of February. Check out Uptown's Catalog of Fun, Entertaining and Educational Game Shows at http://www.funline.com/ or call the Funline 888-220-0077. If you enjoyed the Grammy's and the Red Carpet, why not bring Uptown's Red Carpet Photo's to your next event. Great idea for any type of party or event...Weddings, birthdays, anniversaries, school functions, fund raisers or let your imaginations run wild. Uptown introduces our Newest Game Show…Gone in 60 Seconds! High Energy Fun where groups of contestants compete to see if they can complete the challenges in less than 60 seconds or be GONE!! Complete four challenges and you are a Winner! Call the Funline 888-220-0077 for complete details and available dates. Stay tuned for more updates from your friends at Uptown! Congratulations and Thank You for your interest in Uptown and our Entertainment Services. Monica has won: Overnight accomadations and dinner for two at the Holiday Inn Grand Island, compliments of your friends at Uptown! New Fan Drawing Tomorrow January 20th! GET READY FOR THE DRUM ROLL... Our New Fan drawing will take place TOMORROW January 20, 2011. Overnight accommodations and Dinner for 2 at Holiday Inn Grand Island. Uptown Welcomes our New Fans and friends from Brides World 2011 Show. Thank you for your interest in Uptown and registering for our giveaway.